Lise Holdorf (left) and Melissa Maxwell, who run Barrett’s Mill Farm in Concord. Asparagus picked on the farm for sale. 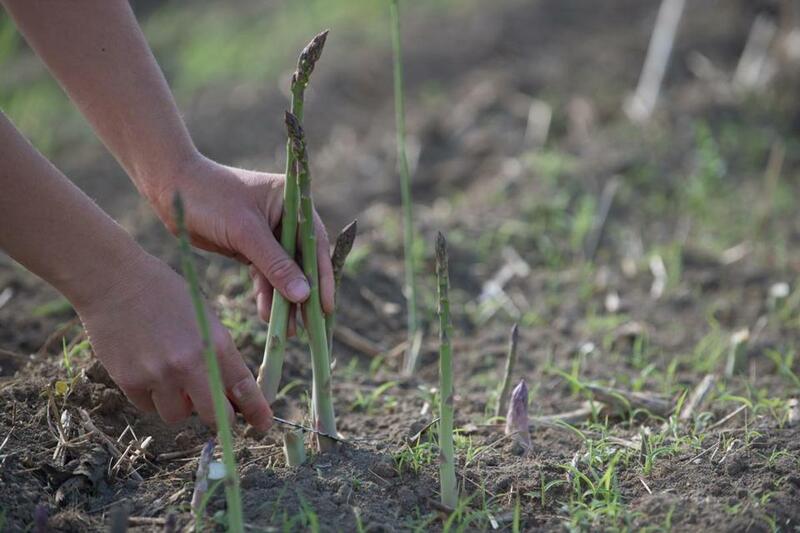 CONCORD — Harvesting asparagus is back-breaking work. “There’s a lot of up and down, moving down the row,” says Lise Holdorf of Barrett’s Mill Farm as she and business partner Melissa Maxwell and assistant grower Rachel Klepner stoop to cut the green spears about an inch or two above the ground. Their white buckets fill with asparagus still warm from their soil cradle. They’ll repeat this early morning routine every day through mid-June until the field is picked clean. Holdorf, 35, and Maxwell, 33, have operated Barrett’s Mill Farm for a year. Holdorf was raised here, Maxwell in Connecticut. They have a five-year lease from the Town of Concord and live in the farmhouse on the land. In order to make the finances work, they’re in the fields six long days a week and do occasional odd jobs on Sundays. The farm became available after former owner Patrick McGrath died in 2012. The town bought the century-old farmstead and in December 2013 requested proposals from farmers who wanted to lease the property. Included are approximately 12 tillable acres, a residence, greenhouse, farm stand, and barn. The women’s business plan was chosen by the town and in March 2014, the two moved in, Holdorf with her husband, Matt Conroy, a high school teacher, and baby daughter Cyra. Holdorf was happy to return to the town where she grew up. “It was too perfect to pass up,” she says. Maxwell had been looking for a farm for a number of years. “It’s unique in this area to find something that could support two people, she says. The women had worked together for a half-dozen years at Appleton Farms in Ipswich. With a full year under their belts, the duo is expanding the planted fields from 4 to 6 acres. “We started small,” says Holdorf, adding that they benefited from lots of helping hands. “The neighbors and farming community in town all supported us,” says Maxwell. In addition to the 50 or so vegetables and herbs they grew last season, this year they’ll be harvesting strawberries, garlic (scapes will be available mid-June, the bulbs in the fall), cipollini onions, red onions, and a mini broccoli variety called Happy Rich. Set the broiler on high. Have on hand a rimmed baking sheet. 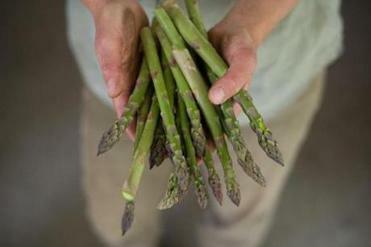 Asparagus is a perennial crop that Barrett’s Mill — and the town — is well known for. 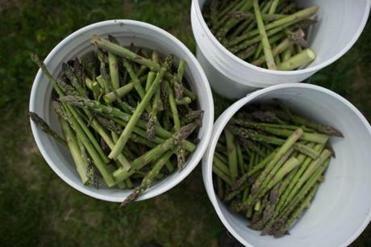 “This farm, in particular, has sandy, well-drained soil that is great for asparagus and strawberries,” says Maxwell. Local restaurant 80 Thoreau makes good use of the flavorful spears on its menus. Co-owner and general manager Ian Calhoun, who lives down the road from the farm, stops by a few mornings each week to buy asparagus for the restaurant. “It’s exciting to see a couple of younger farmers take over stewardship of the land,” he says. Melissa Maxwell (left, with Lise Holdorf) says that the beginning of June is when the farm “takes off.” Crops include newly planted watermelon, asparagus, and eggplant. As women farmers, Holdorf and Maxwell are in good company. 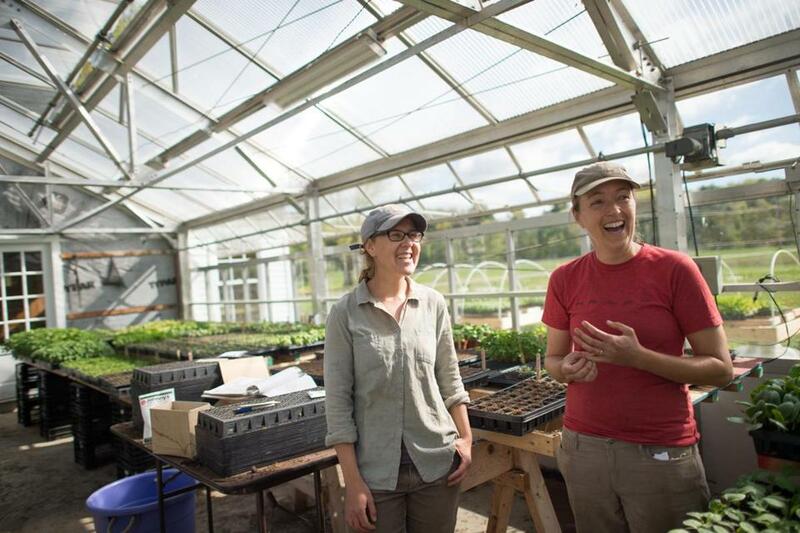 According to the Massachusetts Department of Agricultural Resources, female farmers represent 32 percent of all principal operators in the state. That’s more than double the 14 percent of women principal operators nationwide, according to 2012 data. The disparity is due mostly to the abundance of small farms in the Bay State — there are over 7,700 farms, many of which are just a few acres in size — as compared to mega operations in other regions. The Barrett’s Mill lease costs the women $1,400 per month, which includes the farm land, buildings, and residence. 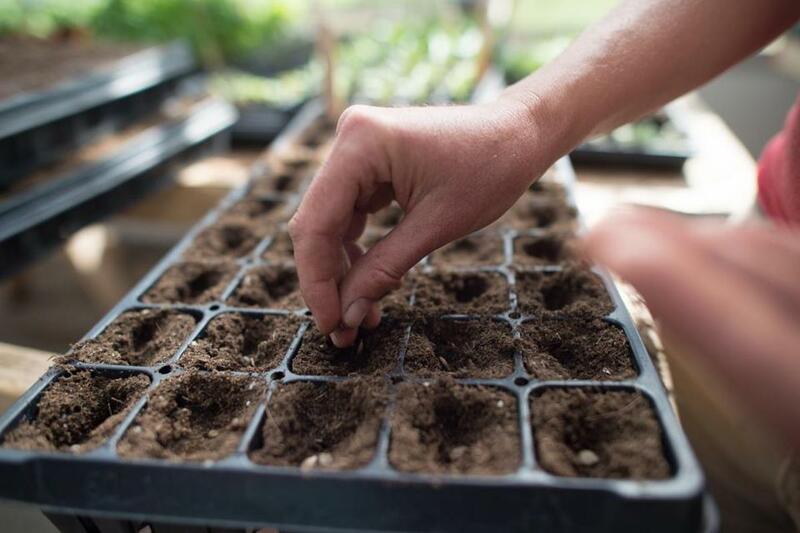 The duo invested their own money in used tractors and implements as well as tools and supplies to build tables for a greenhouse and farm stand. Before they moved in, the Concord Housing Foundation had raised funds for renovations to the farmhouse and to convert it into a two-family home to accommodate two farmers. “It’s in excellent condition and a good place for a family to live,” says Holdorf. The farmers made a small profit in the first year. 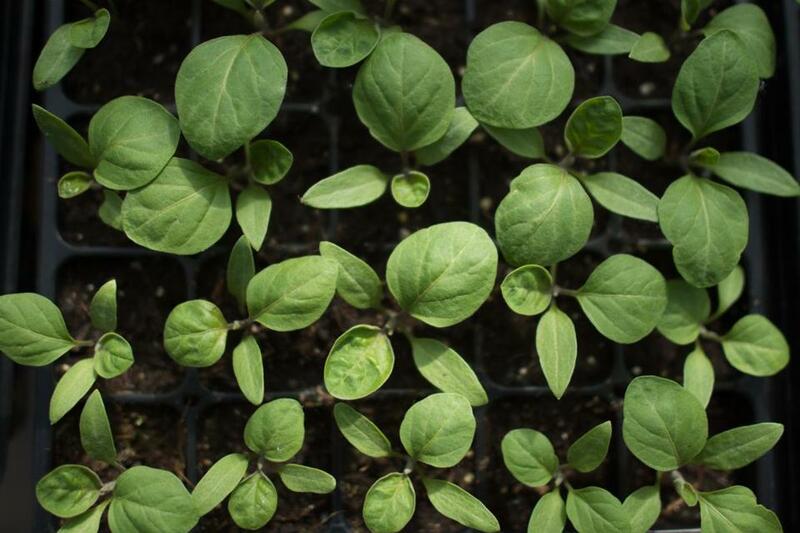 “We did a careful budget over the winter,” says Holdorf, which allowed them to hire one full-time grower and four part-time field and farm stand workers for spring and summer. “This year we’re hoping for long-term sustainable income for us,” she says. Eggplant growing inside the greenhouse. 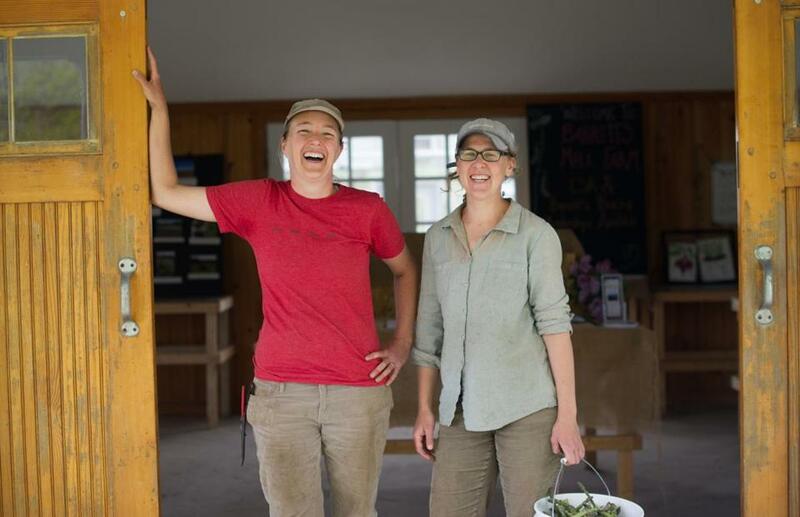 In Concord, both Macone Farm and First Root Farm are owned by women. Susan Macone, 64, has run what was her family farm since the early 1980s. “We do everything the old-fashioned way,” she says, growing award-winning tomatoes, peppers, eggplant, squash, green beans, and other vegetables. She sells her produce at the neighboring Brigham Farm Stand. Concord also has a vivid history. Directly across the road from Barrett’s Mill Farm sits the old, brown and weathered Colonel James Barrett House, part of the Minute Man National Historical Park. The colonel (and his home) played a key role in the first battle — and first victory — of the Revolutionary War on April 19, 1775. After Paul Revere warned of the British Redcoats’ advance, the story goes that Barrett’s sons buried the Colonial militia’s weapons and munitions in the fields around the house to hide them from the British. While the land is old, the Barrett’s Mill farmers are new and as dedicated as their forebears. With every planting (and plowing and weeding and harvest), they’re hoping the soil will be fruitful for at least another 100 years. Lise Holdorf planted watermelon seeds.